Build a house for a specific bird. Build the right size house and hole dimensions. Different species of birds require different sized houses and entrance holes. Inside dimensions must be large enough to accommodate the incubating biard and a brood of growing young. Entrance hole size is especially important. If the hole is too small, the bird you built the box for won't be able to get inside. If the hole is too big, predatory birds and mammals will be able to get inside and reach the nest, and cavity-nesting birds may not use the house. Wood is the best material for birdhouses. Other materials (like metal or plastic) may not insulate the nest enough, so eggs or young could become chilled in cold weather or overheated in warm, sunny weather. Use rough-cut wood slabs, tree sections, or 3/4-inch plywood. Never use creosote-treated wood as creosote may kill the eggs or chicks. Use galvanized nails, as these will not rust. Birdhouses need not be painted, but the box may last longer if you paint the outside. Never paint the inside of a birdhouse. If you paint the outside, use dull (not bright or glossy) colors that blend in with the surroundings. Nest boxes that don't match the vegetation may be easier for predators to find. Build a box that will stay dry and warm. Place the roof of a birdhouse at a slight angle and extend it over the sides and front of the box. In this way, the roof will shed rain or snow and protect the entrance hole and sides from dripping water. Drill four, 1/4-inch holes in the floor to provide drainage if water seeps in. The sides of a nest box should extend down beyond the floor so water won't leak in. Drill small holes (1/8 to 1/4-inch diameter) through each side of the birdhouse just below the roof. This will provide better air circulation. Perches allow predatory birds (like jays, magpies, ravens, and crows) better access to the eggs and young in a nest box. In contrast, cavity-nesting birds rarely use perches and prefer cavities without perches. Be sure young birds will be able to leave the nest. Roughen the inside of the nest box below the entrance hole or attach a sheet of 1/4-inch galvanized wire mesh, so fledging young can climb out easily. Provide woodpeckers, waterfowl, and owls with nest material. Many cavity-nesting birds will add their own nest material, but the woodpeckers, waterfowl and owls prefer nest boxes with 2-3 inches of dry sawdust or woodchips in the bottom. Put your birdhouse up on a sturdy pole, post, tree, or under a house eave. Freely swinging birdhouses are rarely used. Be sure to place the birdhouse at the proper height and in the right habitat for the bird you want to attract (see distribution and habitat information in the dimension table). Face the entrance away from prevailing winds. Don't overcrowd an area with nest boxes. Most cavity-nesting birds defend territories, so don't overcrowd an area with nest boxes for a single species. 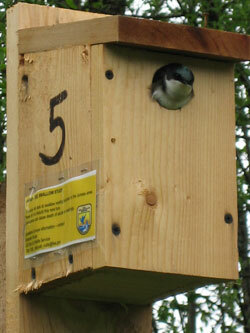 Usually, nest boxes should be placed 50 feet or more apart. Swallows, however, will tolerate neighbors and will sometimes nest in apartment birdhouses. Build your nest box so that it is easily maintained. Construct the birdhouse with a roof or floor that can be easily removed so that you can reach inside to clean it. Nest boxes should be cleaned out each spring and disinfected to prevent the spread of avian diseases. Be sure to dry the inside and (if necessary) add fresh, dry sawdust or woodchips.